Find hotel near Ropeway From Joshimath To ..
Auli Ropeway covers the distance of 4 kilometers and connects Joshimath to Auli. 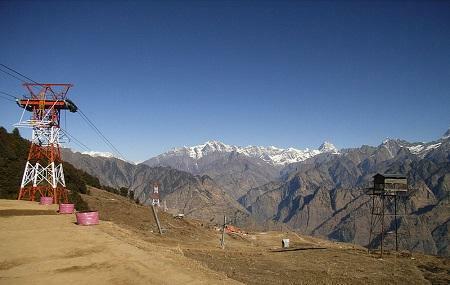 It is the easiest way to reach Auli and to witness the beauty of snow-covered landscapes in the winter. The gondola rides start every day at 9.30 am and end at 5.30 pm (6.30 pm if it is crowded). It takes a little more than 20 minutes to reach the top and if the weather is clear, you may get to see Nanda Devi and Trishul peak as well. The tickets are INR 750 per person. The only drawback is - you cannot reserve a ticket online. You will have to visit the ticket counter at Joshimath to collect the tickets.